Are we already past “Peak Geoscience”? That’s the fascinating question posed by long-standing Neftex/Halliburton colleagues at EGU next week in the plenum session: “Peak Geoscience? Uncertainty, unknowns and the future of geoscience”, Monday 8th April. Perhaps geoscience will become less critical to economic growth as we progressively de-carbonise the economy over the coming years? Right now, however, there’s no obvious tail-off in the rate of new geoscience research publications appearing each year. The graph above shows the number of publications per year, from the Web of Science repository. Note the log scale on the y-axis, and that the data are not cumulative! We’ve seen a thousand-fold increase in the last 100 years! 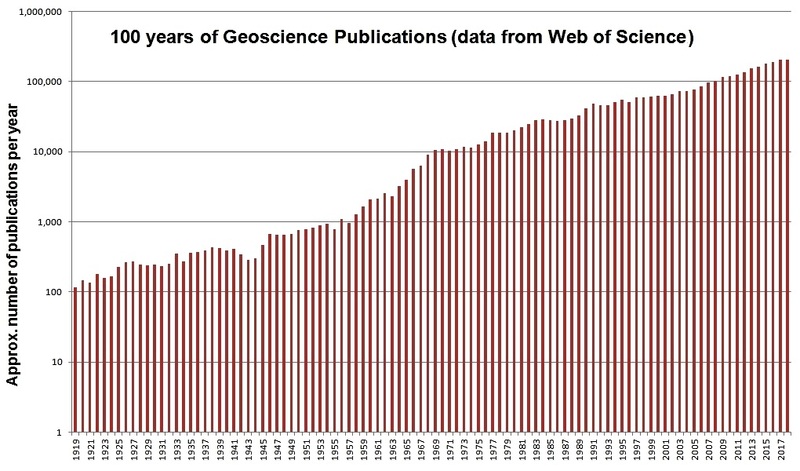 If this rate continues, then within 15 years we’ll produce over a million geoscience publications per year. In 30 years we’ll publish more in one year than we did in the last 100. In 50 years we’ll reach 18 million publications a year, and in the final year of the century a mind-boggling 207 million – that’s more than six new geoscience publications every second, day and night. And by then, the total cumulative number of publications produced over 200 years (i.e. from 1900 to 2199) will have reached 2.6 billion!